We’re back in Melbourne and fortunate enough to find time to interview the incredible friend of The Interpreters, DJ Miss Match, currently residing on the rooftop of The Red Hummingbird in Russell Street. My story is I met Mitch, my boyfriend of 5 years, and he was learning to be a DJ as well as learning to produce. At that stage, I was on the sidelines but saw how good he became. He passed away in 2001 and a year later, l bought turntables because I wanted to keep listening to the music that he was playing. My interest grew. I bought records and started to muck around at home, ‘bedroom bangin’ as we call it, and then 6 months into that I began playing house parties, which led to a few residencies around Sydney – and it just took off from there. My influence and my drive was wanting to continue what Mitch had started. 2. The Interpreters spend a lot of time trying to understand client customers, segments within the market and people. Thinking about a gig, how do you design a set that you know is going to appeal to a crowd you only see when you’re in the moment? I talk to the promoter and find out what clientele they’ve got or are expecting that night – what age group, what time I’m playing, I go and view the venue and set-up beforehand as well – I try to gain as much info as I can. If I’m playing first set of the night, I need to cater to an early crowd – these are people who might want to sit around and have a drink and not necessarily be up for dancing. I never plan a whole set but when I arrive I’ve got an idea of what I’m going to play but I take enough music to cover everything because I never know what’s going to happen. In the moment, you have to watch what’s happening in front of you. You need to watch what people are doing, where they are at, when you think it’s a good time to up it a little. After playing bars and clubs for over a decade, I now know when people are wanting to dance, they might have had a few drinks, or it’s 9 or 10 o’clock and you can see people getting into it even before they’re on the dancefloor. That’s when you throw in some familiar tracks. I tend to target girls first so more female friendly tracks – the girls will come up and the guys will follow. That’s how you start a dancefloor – you must watch your audience all the time to take them on a musical journey. 3. We do a lot of problem solving at The Interpreters so we’re interested in how other people solve problems. How do you solve problems as a DJ? There’s so many things that can go wrong at a gig. The way I deal with it is that I try to fix the things I know I can do in the moment, whether this is related to equipment, style of music not quite working, lighting, technical issues etc etc. If I’m playing the wrong music, I have to recognise that and change it. I am the one creating the vibe and the feel for the whole place so it is very much on my shoulders and I need to be able to adapt and see what’s not working and what needs fixing. It could be as simple as lighting or positioning of a speaker, or master volume but you need to take it all elements in the moment, and adapt quickly. 4. Interpretation is subjective but a key part of our analysis. We’re always interested in the ways other people might interpret key trends or things of interest from their specialism. What are the latest trends when it comes to music and what’s driving these? I think the trend in music is the fact that there’s so many different trends. The industry and the people who listen to music now have not only a plethora of options, there’s more ways in which they can consume music. As a DJ, I’m just one means they can get their music fix and their reason for listening to what I’m playing, is completely different to why they might listen to something in their bedroom or what they’re exploring on SoundCloud. What they listen to on the radio is probably very different to what they are streaming. I think that if you recognise the reason why people are at your venue or listening to your music, then you can cater to them in that moment. So not so much as a trend but more recognition that music is a part of many people’s lives and for different reasons. 5. Thank you for taking part in 5 in Five – the last question comes with a gift as an appreciation of your time. 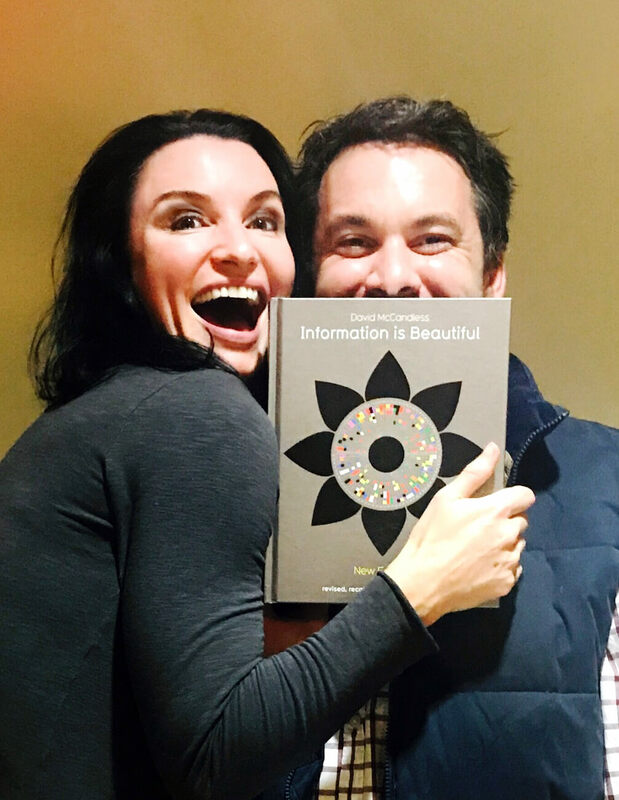 Because we firmly believe that Information is Beautiful, we would like to give you a copy of Information is Beautiful, ‘a stunning visual journey through the most revealing trends, fascinating facts and vital statistics of the modern world’. In the last minute, and because first impressions matter, have a scan through and for the 5th question, tell us which visualisation caught your attention and why. For me, it’s the imagery that stands out the most and caught my attention. It’s nothing I’ve seen before – the strange pixelisation of bands of colours. I don’t necessarily understand what it’s trying to say but I guess that’s the power of the image – it’s drawing me to it and then making me want to learn more. It’s such a weird thing to see on a full page but I’m hooked.